Have you heard the latest? The Usability Professionals Association (UPA) is rebranding to User Experience Professionals Association (UXPA). How do you feel about that? Do you think it’s a good move or one that’s more motivated by profit than member value? When I first heard the news my instant thought was that they’re jumping on the bandwagon of the term UX to increase their membership numbers. Cynical me hey! After reading the official Press Release though I’m still not totally clear of the benefits this will bring to me as a member, in fact I’m concerned the content may be more diluted and I’ll have to do more digging to find the stuff I’m interested in. The UPA say ‘many of our members are increasingly involved in User Experience Strategy. Our new organizational model allows us to deliver content on all four of these pillars: Research, Design, Evaluation, and Strategy’ but to be honest they do this anyway so I still believe the change is to appeal to more potential members, which I can understand from their perspective. As terminology, User Experience is much more attractive to people than Usability. Usability is often seen as more rigid, boring and formal (thanks in part to people’s first impression of useit.com – ‘oh is this what good usability does to a site? bleurgh! no thanks!). So, I think it’s reasonable to assume that the UXPA will gain a lot more members and these will come from a wider variety of backgrounds. I’d like to see the site cater for both the different specialisms and the different levels of experience between members. By this I mean I’d like to see areas within the site and forum where I can geek out about UX with people who see it from many different viewpoints. People come into UX from a wide variety of backgrounds, more varied than usability, so the UPA will need to think about the structure of the site and forums to cater for everyone. I’d like to see different membership levels for those who are UX professionals and those who may just be joining as they have an interest in the subject. My own view is that I’m not really too concerned. I’ll be happy so long as the IA of the site is really well thought through with lots of different areas to discuss UX from many different viewpoints and of course we’ll still need an area for Usability! I just hope the new UXPA can actually cope with a higher number of members because in my experience it’s an organisation that, well, isn’t actually very well organised. The first time I applied to join the UPA was many years ago… They lost my first application, they received my second application then lost it and I have no idea what happened on my third attempt as I heard nothing from them and that time I gave up. I recently tried to join again, this time my application was processed (hooray!) but I did have to ask them to resend my welcome pack as I didn’t receive the first one. So yeah, let’s hope they get the IA spot on and can cope with the increased demand. What are your thoughts? Are you a current member of the UPA? Will you be joining the UXPA? What impact do you think the name change will have (if any)? 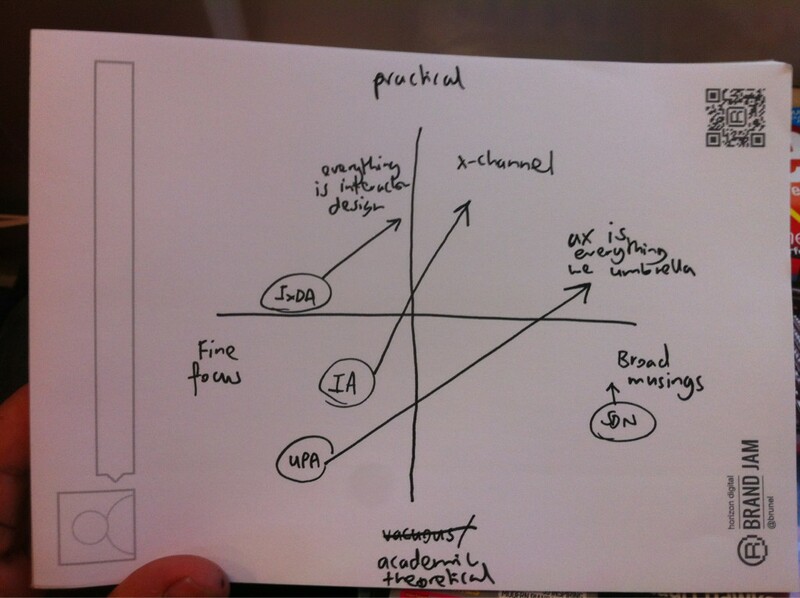 Finally, below is a sketch by @jasonmesut that I think highlights the potential impact of the name change rather well. I also recommend reading Louis Rosenfeld’s response which is both amusing and highlights the lack of vision for the name change. Lisa, great post. These are the specific types of discussions we need to be having. I’d ask that you bring up these very questions over at the new discussion forum at http://www.uxpa.org. We have sections for Membership (for your “levels” discussion) and SIGs (for your “specialisms” discussion). We’re trying to collate everything we’ve heard over there. Thanks for your insights! Thanks Rich, I will definitely do that. As you know I’ve already mailed you with my thoughts and I’m pleased to see you’re doing a brilliant job of listening to everyone’s opinions and taking the time to respond to everyone. For anyone reading this who isn’t aware, Rich is the president of UXPA. find your email subsfription hyperlink or newsletter service. know I aam getting knowledge everyday bby reading thes nice articles or reviews.